A shtetl on 42nd Street? 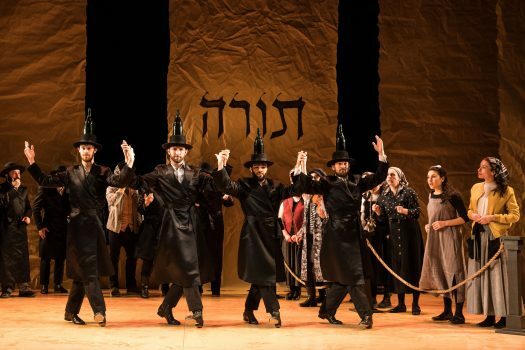 NEW YORK—It was a decision of genius for The National Yiddish Theatre Folksbiene to transfer this production of “Fiddler on the Roof” from its original site at downtown’s Battery City to its present run on Manhattan’s Theatre Row—Stage 42, in the heart of New York’s theatrical melting pot. And in Yiddish? You bet. 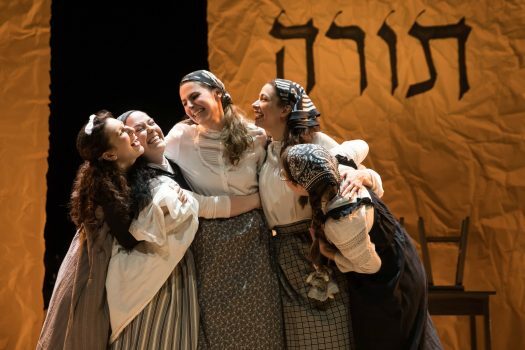 Because now you’re experiencing this brilliant, beloved musical in the language the stories of Sholem Aleichem (upon which the musical is based) were meant to be heard in. Furthermore, handily placed English supertitles on either side of the stage are barely needed, so clear is the playing. Under the direction of that consummate performer Joel Grey, the story of Anatevka, the fictitious Russian village, and its citizens unfolds so firmly, so realistically, that one often feels oneself in an actual place—not sitting in a theater. Here the milkman Tevye (Steven Skybell) plies his trade. When his horse that pulls his milkcart goes lame, he himself bears the burden. Presently, he is dealing with getting the oldest three of his five daughters married off. The underlying thread to this process is tradition—holding on to it, or being forced to let it go. All in this place are Orthodox Jews, wherein it is tradition that the father must choose his daughters’ husbands. Firstborn Tsaytl (Rachel Zatcoff) readily complies—almost. 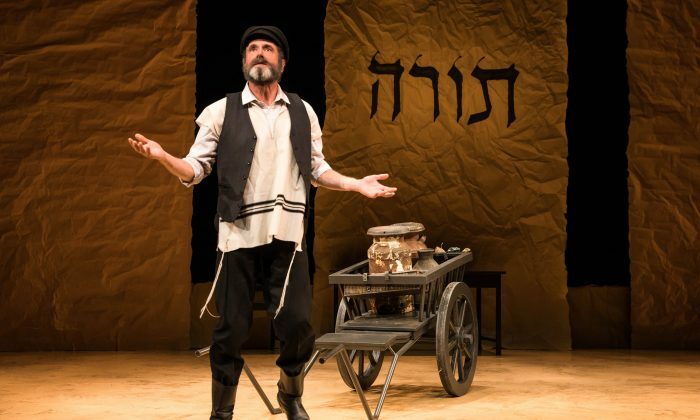 She wants desperately to marry Motl (Ben Liebert), an impoverished tailor, if only Tevye will break his agreement with the wealthy butcher Leyzer-Volf (Bruce Sabath) to marry Tsaytl. Although the break is accomplished, hard feelings remain. Hodl (Stephanie Lynne Mason) convinces Tevye that she will be happy living in Siberia with her beloved Perchik (Drew Seigla). Tevye blesses her departure with a heavy heart. But tradition can only be pushed so far. As for Khave (Rosie Jo Neddy), her love for the non-Jew Fyedka (Cameron Johnson) is unforgivable. 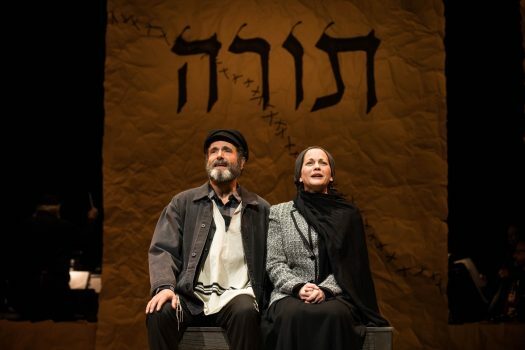 Tevye pronounces her dead to him, although he himself is pained by his decision. Tsaytl and Motl’s traditional wedding scene, interspersed with the famous bottle dance (men dancing while balancing bottles on their heads) with original choreography by Jerome Robbins, is extravagant and vivid—a fireworks display bursting the threads of simplicity. I could not account for my eyes tearing during much of the performance. Am I, and others in the audience, suffering from the loss of tradition? Or are we stressed by various insecurities wrought by contemporary life? The worst possible situation ultimately reaches Anatevka. A pogrom will soon take place. All must pack and leave everything within three days. Where to go? Tevye’s wife Golde (an excellent Jennifer Babiak) embraces and comforts her close friend, matchmaker Yente (the inimitable Jackie Hoffman). Skybell is not tempted to play for laughs, or to introduce shtick. His is a performance that conveys authenticity, virility, and true caring for his character’s plights. Musical staging and new choreography have been added to Jerome Robbins’s original by Stas Kmiec. The minimalist set by Beowulf Boritt and Ann Hould-Ward’s deliberately shabby costumes complete the picture. Here is art. But it is not artificial. Here is a “Fiddler” overflowing with exuberance and warmth.